You will not believe this but I’ve teamed up with my friends to host the giveaways of all giveaways this holiday season. I’m talking 26 amazing contests for you to explore — and they are all AMAZING!!! AHHHH! I mean… can I enter? Actually – I can’t … but whatever. I’m not bitter or anything. Tis’ the season to be festive. So, I’m giving away a $50 gift card to Home Goods – one of my favorite stores. To enter, try your luck by filling out my Rafflecopter form below. Ready to enter some of the other contests??? 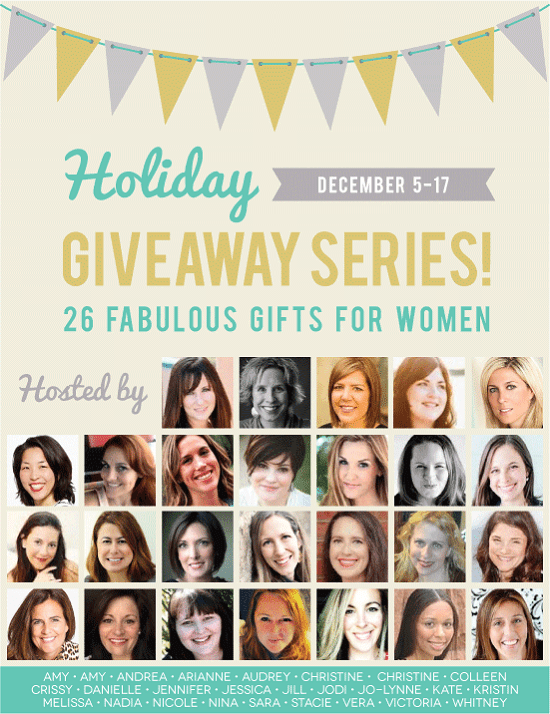 Here you go — all these women are part of my CLOSE blogger friend circle. So, don’t be afraid to head on over to their sites and enter. I love Home Goods! You never know what treasures you’re going to find! I would get holiday decor so I can use it year after year. I love home goods selection and there prices. It would be hard to decide but I would probably buy new towels for my bathroom (they are really needed!). I’d use my GC to buy new room decor for our daughter! I love the prices at HomeGoods! I would use the gift card to buy something for my Mother! Holiday giveaways are the best!! they have such a good deal on gift wrap but also I am so in need of sheets to that is where I would head first toward the bedding. I would find some cute shelves and decorations for my powder room. I love the surprises at Home Goods. But I also love the things I can count on – like quality and a great price. And the soaps. I buy their liquid hand soaps and have never been happier with my hand soap. I would buy surprises – maybe a really nice tablecloth or two. I love Home Goods! I would use the gift card toward a new rug. Recently, I visted Home Goods for the first time, and fell in love! They have a great selection and great prices 🙂 My mother-in-law was with me, and she had her “eye” on several things, so I would use the card for her! I would use the gift card to buy bedding for my guest room. If I won I would love to get some new towels. I love how Homegoods is always fresh and new every time I go in there I find something else to love! I would use it for holiday shopping. Love the great price and selection of HomeGoods. I will decorate for Christmas. I love Homegoods because they have everything you want for decorating your home! Wonder Christmas shopping spree ! I lurve Home Goods! I would probably scoop up more kitchen gadgets or serving platters. I would get something for our eldest. I would love to get things for my son’s room! They have the best things! I’d buy some new decor for my house. It could really use it! I love that I always find something new and different at Home Goods. I’d get some new decor for my home – it could really use it! I love that I find something new and different every time I’m at Home Goods. I would use the gift card to buy presents for family/friends!! I would use the giftcard to decorate my new apartment. We moved about a year ago and still need curtains! This would really help us pull our house together. I would use the gift card to buy a housewarming gift. I love their lamps! I would get a couple for our new home. I need some shelves/small cabinet for a little nook in my living room. Home Goods would be perfect for this! Love the variety of stuff they have at Home Goods and the prices. I’ve gotten some great things for our home as well as really reasonable birthday party gifts there. I would love to get some nice Christmas decorations! I would buy some new home decor. It’s a rare opportunity for me. I love Home Goods prices and style!! I love all the baking products they have. I’d use the card on that kind of stuff. I will buy some items to freshen up my living room. I love that homegoods have cute, affordable items. FUN– love home goods… but I always spend way too much in there.. I would love some more holiday decorations.. I would get some pretty candles for holiday decorating. Some home decorating stuff since I just moved into a new house. Thanks! I love Home Goods! It’s always a treat when I make it to one when we’re traveling. I would especially love some more storage for my home. I love Home Goods! I need some fun curtains for my office. I would give it to my mom since she wants some new pieces for the house. Love to find holiday decor at home goods! i love all the eclectic stuff they have that fits everyone needs! I would buy stuff for the house and decorations! More holiday decor – love Homegoods! I would buy a lamp. I love there big selection. I would get new throw pillows for my sofa. I love their great prices! I’d use it to buy more christmas gifts. I think I would look for a cozy new blanket for the couch to snuggle up in with my kids. I’d get something for the kitchen. I would get a new decorative mirror. I love the selection and variety of unique products they have. I would buy my mother-in-law some new pans, hers are all scratched up and old. Her husband passed away recently and they were very frugal, wouldn’t splurge on new pans. This would be a great present for her! I love all the home decor and kitchen gadgets. I have never been to a Home Goods store but they look like it would have many different options to help you make your home the best it can be. I need to look at their storage options for my kitchen. We are moving soon, and I would use it to buy some new decor for our new place. It’s been awhile since I have updated pillows and such. 🙂 I love the affordable prices! I would buy things for our home. Since we moved in we haven’t really decorated much. I would buy presents for my kids. Love the kids toys and furniture. I would buy a ton of candles! I would buy some new rugs. I love the selection and price! They have quality items at great prices. I love that they have such great deals. I’d probably get something for myself and let my mom grab a little something too. I would use it to buy a birthday present for my mom. I have always been a HUGE fan of Homegood’s, TJ Maxx, and Marshall’s….. so naturally I jumped on this giveaway!! I would use this for a gift for my mom…. I would find something extra special for her there and gift it to her! Thanks for the lovely giveaway!!! Trying to win money to buy presents this year. I would keep this and use it to finish up the christmas shopping! I’d love to get a few extra holiday decor items from Home Goods – they have some pretty great candles, ornaments, and snow globes for starters. I love the prices and variety of items at Home Goods and shop there for friends and family often! I would get some new pillows for my living room. I love Home Goods! They’re so affordable! Christmas decorations are my passion, as long as I have snowmen everywhere I am a happy camper! I love HomeGoods! I love the ever changing selection! I’ll use the giftcard to get some new throw pillows. I love looking at the lamps and kitchen ware at HomeGoods. I love their clothes the best! I’d buy some new winter cozy clothes! I love everything about Home Goods! I could spend hours just browsing! I am getting a new apartment soon and I’ll need new furnishings so I would use it toward that! id use it to buy those last minute gifts! Home Goods is a wonderful place. So many different things to choose and I would use the gift card for Christmas gifts. I love home goods, I would use the gift card to decorate a new apartment. It’s fun to browse at Home Goods. I need a new lamp for the bedroom so that’s what I’d put the money toward! I LOVE Home Goods! I would use it for new bedding. I would buy some new lamps! I love the selection (and the prices) at Home Goods! I would give this to my mother in law who loves to decorate. I will use the Home Goods Gift Card for gifts for my 21 friends and relatives. Three of the gifts are already given for the out of town ones who won’t be back for the holidays. Weekly, I go to Marshalls and TJMaxx, which are sister companies to HomeGoods, to see what’s new that’s come in. that’s up to my other half. I will use it buy a few things for my nephews nautical room. I love that Homegoods has everything to make your home look nice at a reasonable price. I would use the gift card to add artwork to my new apartment! I love the selection at Home Goods. I’d love to get some serving bowls. I do enjoy the cozy feeling of Home Goods. I’d like to get some serving bowls. I think I really like the cozy feel of Home Goods stores. I would buy decor for my bedroom! I love Home Goods! I would use it to buy some new kitchen item! I would buy the most delicious gluten free baking items! We don’t have a Home Goods store near us; I have never been in one. I will have to look online to see what they have. I would love to find some home decor, maybe throw pillows? Thank you for sharing. I would use the gift card to buy holiday decor…I have a Christmas obsession! I love the great selection of products they offer. I will use this gift card to spruce up my living room- we just bought a new couch and would love to get some new accessories to tie the room all together!I love home goods prices!!! I can’t stay out of the bath section of Home Goods. I love towels, rugs and bathroom accessories. I have picked up some really lovely items and the prices are always awesome! I would buy some new throw pillows – ours are getting really old. I love that they have lots of different things in the store! Thanks! I will probably buy some wine glasses and maybe a vase. I love everything about homegoods. My mom never spend money in her self and always spend it on everyone else. So I’d take her to buy whatever she wants for Christmas . Love HomeGoods! I would buy mirrors. I would use it to buy my sister a house warming gift. I would get something new for my bedroom. I would buy something for myself, maybe a mirror. Love Home Goods. i’d buy some new bedroom décor! bedroom lamp just broke need a replacement! I have never been in a Home Goods but they are putting one in about 20 minutes away from me! I love housewarming gifts at Home Goods, and I would use this to buy new curtains. I would help out a coworker that recently lost everything in a fire to make her Christmas better. I have never been to Home Goods, but would love the chance to go and do some shopping! I would use it towards decorations for our new home. I love the great variety that Home Goods has and their prices are more affordable. I would like to win it to give to my sister. I like Home Goods up-to-date trendy bedding. we need a new desk lamp, and love the prices! Id get some Christmas throws. I would give this GC to my sister. What I love from Home Goods is their selection of frames. I will give this to my mother or use it to buy something for my sister in law. I am unsure as of yet. I would buy some bathroom decor for our master bath. I love Home Goods for the variety and their prices! I would use the giftcard to get some decor for my bathroom! I would use the gift card to by a new bedding set. The fact that Home Goods has such a wide selection of things for my home is what I like most about the store. I would use it to buy some after Christmas decorations and home decorations. I’d like to buy Christmas decorations! I will buy some new towels! I will buy something for our house! I love to cook! I love that I can always find adorable, unique home décor! That is what I would shop for! I would use the gift card towards some nice comfy new sheets. I love the great variety of items I find at Home Goods and the great prices. I love the quality of the items at Home Goods – I would look for some new curtains! I’m thinking some cookie sheets would be a nice addition to my kitchen! I love the kitchen items–bowls, glassware etc. Home Goods always has something new and different whether its for the kitchen or the bathroom. I’m also thrilled that a store opened close to me. I would use the giftcard to buy presents! My mother actually won products from Home Goods recently. They are quality, smell awesome and are beautiful. I would love to try them out too! Thank you for the opportunity to win! I’d buy some mixing bowls. I love Home Goods because they have unique items for good prices. I would use the gift card for my Daughter-in-law! I’d be looking for a lamp and throw pillows for our porch. I have never been to a Home Goods but did check the locations. One is by my son’s place two hours away and one is near hubby’s family just an hour away. Thanks! I would love to give this giftcard to my mom if I won! She loves homegoods and what better way to spread holiday cheer then to give this season! I have two tweenagers who are all grown out of their little girl room. I’d use the gift card to help them get some nice new things. I would buy pillows! Love the prices and selection at Home Goods! I love their home section and would use it to buy something for my kitchen. id get some christmas presents with it- i love their blankets and home decor! I would use it to help me organize and decorate my guest room. I love homegoods because of the great gift and decorating ideas targeted at all different budgets. I love the clearance sections.